On Nov. 10, representatives of GreyStone Power Corp. presented a check for $28,000 to Phil Collins, development officer for the Corps of Cadets at UNG. From left: Milton Jones, veteran and chairman of GreyStone's Board of Directors; Collins; Capt. Elijah Carroll, an alumnus and instructor in UNG's Department of Military Science; and Gary Miller, UNG alumnus and GreyStone president and CEO. 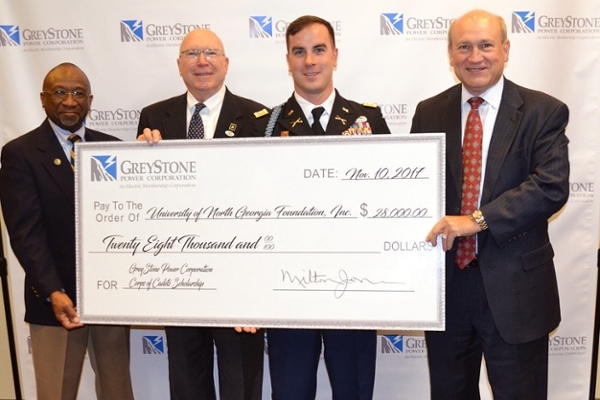 GreyStone Power Corp., located west of Atlanta, has given $28,000 to endow the GreyStone Power Corporation Corps of Cadets Scholarship at the University of North Georgia (UNG). 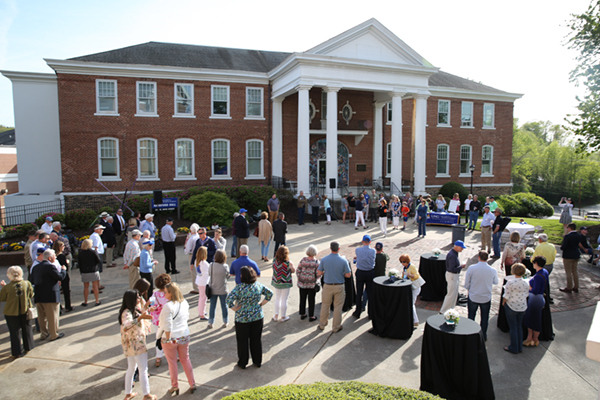 UNG's five campuses are located outside of GreyStone's eight-county service area, but two executives of the company are alumni of the university. Gary Miller, president and chief executive officer of GreyStone, is a Dahlonega, Georgia, native and a 1992 graduate of UNG, and his wife, Bonnie, earned an associate degree from UNG in nursing in 1981. 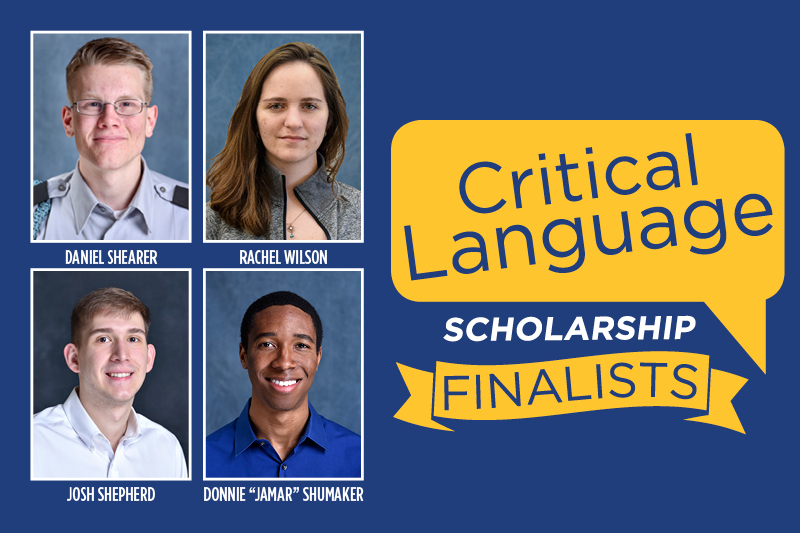 Additionally, James Wright, vice president of corporate services for GreyStone, and his wife, Miranda, both graduated from UNG in 2006. Wright also serves on the UNG Alumni Association Board of Directors. GreyStone also was presenting sponsor for the 2017 Boar's Head Alumni Weekend kickoff and guest speaker, retired Col. Jimmy Blackmon; the event is hosted each year by the North Georgia Corps of Cadets Association (NGCCA). "We are well-aware of the legacy of leadership, courage and sacrifice that alumni of the corps, like Col. Blackmon, represent," Wright said. 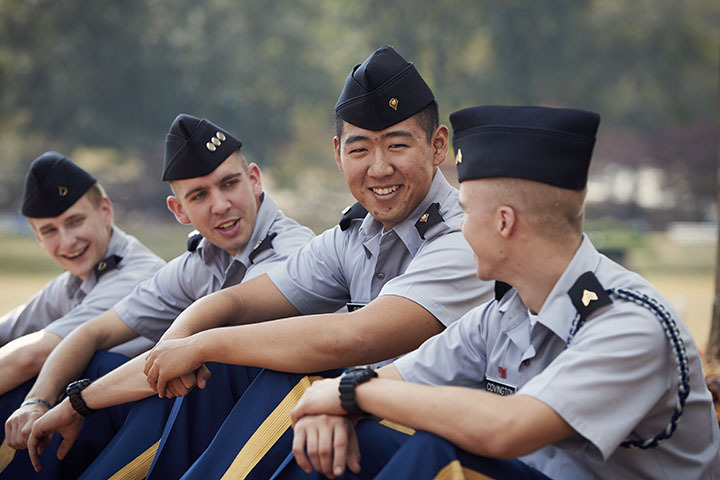 "We hope that our partnership with the NGCCA and the Corps of Cadets will help to strengthen UNG as the Military College of Georgia and help prepare cadets for their future roles as leaders in our Army, our state and our nation." On Nov. 10, representatives of GreyStone Power Corp. presented a check for $28,000 to Phil Collins, development officer for the Corps of Cadets at UNG. GreyStone is a member-owned, not-for-profit electric cooperative located west of Atlanta that serves Paulding, Douglas, Fulton, Coweta, Cobb, Fayette, Carroll, and Bartow counties.